OK, so I just wanted to wrap up my Iceland adventure tonight with THE COOLEST things I did while I was there. So. Allow me to set the stage. There are a couple things you should know about me. #2: I hate being outside. #3: I hate being cold. #4: I hate lake/ocean water. So. Knowing this..you’re probably thinking…then why the heck did’ja go to Iceland!!? Let’s just say…it was a trip that was 100% out of my comfort zone. But honestly, that made it all the more sweeter!! One of the most amazing things we did was go snorkeling in the glacial waters of Silfra, between the tectonic plates! The water was literally 34 degrees F, and these tectonic plates are active! I’m gonna keep it real…I was straight up scared to go. We took the bus out there, got all geared up in these Power Ranger-esq dry suits, and even with my flippers on I still wasn’t sure if I was going to take the plunge. Long story short, I went. So glad I did. It was incredible. Truly. The water is SO clear, albeit cold as all get out. And it’s so clean they even told us to drink as much as we wanted! It was absolutely breathtaking. OK. And then I’d say the most jaw dropping thing we did was boating between the icebergs to the glacier. That was, hands down, the most incredible thing I’ve ever done in my life. And the drive out to the glacier was such a visual extravaganza, looking out the window and seeing everything from sheep, to farms, to water falls, to hidden hot springs – wow. But being next to the 12,000 year old glacier, I truly felt the magnitude of God’s creation. And finally, horseback riding on the black sand beaches gave me such a connection with the outdoors. For a girl who has a love/hate relationship with nature, this was one of my favorite memories. We rode for 3 1/2 hours – in the rain – and we got to this stunning black sand beach. The arctic waves were just crashing on the shore, and we got to gallop on horseback and feel the athletic magnificence of these beautiful creatures. After all that adventuring, I was so ready to take a warm shower and crash that night at Hotel Klettur in Reykjavik. It’s funny: the four nights that we were in Iceland, we slept a TOTAL of about 12 hours. Between going out to the clubs and getting up early for rental car pick ups and road trips, we just decided that sleeping would be the last thing on the totem pole. But dang, what a beautiful hotel. It’s located just a short walk (read: 7 minutes) to the heart of Reykjavik. But honestly, that walk was our favorite thing we did in the city. You walk past so many cute little shops and houses and restaurants. It was a cultural education. And the view out our window was so beautiful – the last morning there was a rainbow stretching from the Harpa Concert Hall to the water. Here’s what I loved about Iceland: the hospitality was SO AMAZING. Every restaurant I went to, the chefs would create a delicious meal to meet my food allergy needs. The tour guides, shop/rental car owners/gas station attendees/hotel concierges/waiters — all SO ACCOMMODATING! Everyone speaks perfect english, and really makes you feel welcome, and goes above and beyond to make your stay positive and memorable. WATERPROOF SHOES ARE ABSOLUTELY ESSENTIAL — The morning of my flight, I decided on a whim to get a pair of rain boots “just in case.” And boy, am I glad I did. It would have been a different trip without them. Not only did it rain the entire time, but you’re walking through nature – over creeks, in the mud..you get the picture. Don’t let your feet ruin your trip. And bring 4 more pairs of socks than you think you need. ICELAND IS PRACTICALLY CASHLESS — Everywhere takes credit cards. Yeah, take out a little cash for tips (see below) — but you’ll just end up spending most of your unused cash at Duty Free at the airport to “get rid of it” at the end of your trip. TIPPING: Tipping isn’t a thing there, however, if the service was “above and beyond”, it is appreciated. So for example, I would always tip 20% at dinners because the chefs would literally make me a special meal to meet my dietary needs. EAT BREAKFAST AT THE HOTEL!! Hotel Klettur had an amazing breakfast buffet. Even I — with my laundry list of food allergies — had one of the best breakfasts of my life. They have gorgeous fresh fruit and vegetables — whole kiwis, pineapple, melon, whole tomatoes, peppers, cucumbers — it was so delicious. And then all kinds of cereals and a yogurt bar, and hot food, and meats and cheeses and pastries. Breakfast of dreams. So eat a big breakfast. Pack a lunch from BONUS. And then go out to dinner. My vegetarian dinners with one cocktail were typically around $60. RENT A CAR, AND DO IT EARLY. Seriously. This was the best decision. If you rent ahead of time, it’s about half the price than if you wait and do a “walk in.” The worker at the car rental (another cute Icelandic gentleman) even told us that the rental car industry is “F-ed up” with how they charge people so steeply. But it’s so worth it. There’s a spontaneousness with a rental car that you just don’t get with a tour bus. So there you have it. Thank you Hotel Klettur, for such wonderful hospitality. Iceland, you stole my heart. My friends and I are going to cherish these memories forever! Now go book your flight! Book your stay with Hotel Klettur. And book it to Iceland! It’s waiting for you!! Previous Post MY BOOK LAUNCH! I knew your post would give extremely rave reviews. I’m glad you were able to have such a wonderful experience. Are you sure you did not tuck one of those Iceland boys in your suitcase? Glad you had a blast. Wonderful photos – glad that you had a great time! Now I gotta go 🙂 it’s on my bucket list. Being in Australia, it’s a loooong way unless I do a trip to US to make it all worthwhile. Iceland was never on my radar for a vacation, but you make a convincing case to look at it. I know what you mean about love/hate with nature. I enjoy the beauty of looking at it, not so much living IN it! I couldn’t help noticing that the horse had to take up some slack for you by smiling when you apparently weren’t ready to! Glad you are safely back and that all is well on the home front! I’m flying to Toledo Wednesday, job interviews at the company all Thursday morning, lunch with them, then back to Toledo Express to await my flight home. Making progress on the inspirational speech; I may have to whittle it back once I finish and time it, but better than the opposite problem! Julie, Hillary, and I had a fun Labor Day together. No big activities; just lunch out and a short book shopping trip to Mississippi just for fun. I’ll let you know how it goes! Thank you for your kind thoughts and prayers! What an amazing adventure!! Great photos and narrative. Thank you for sharing!! if I wasn’t sold before, I totally am now! Great post! Thanks for sharing! Thanks for sharing, it was like I was right there with you! Thanks for taking me there! It has always been on my bucket list. Great photos and fun adventures. Maybe someday I will follow in your footsteps. As a kid I was taught the whole “Iceland is green, but Greenland is ice” message, but every internet celeb that goes to Iceland seems to post about how cold it is. Good luck with the book, my friend. God bless. Gorgeous pictures! Sounds like it was a great trip! I will have to bookmark this for the future…. I found your blog after you randomly liked a recent post of mine – so first, thanks for reaching out and allowing me to discover you! I literally had a coworker of mine from college post a few pictures of her in Reykjavik – with Iclandic horses – yesterday, and for a minute I thought I was going to have a seriously “small world” moment! Y’all live in different states though 😉 That aside, I loved reading this/ogling at the gorgeous pictures//learning a bit, and congrats on your book! Glad you had a good time, and made it home safely! God is so generous! I have nominated you for the Real Neat Blog Award because I think you have a neat way of encouraging others. God loves you! I loved your post and can relate to your experience since I traveled there last March. We had tour guiides and there were 8 of us in a van. Yes. Very very cold, esp at night when it was windy. We saw the Northern Lights, went hiking on a glacier, hiked through ice caves, saw the wild horses running free everywhere, and sat in the hot springs after hiking there. So proud that you got out of your comfort zone and tried new things. You give me hope that my son may someday enjoy nature outdoor activities too. And I’m always looking for a wife for him. Wink wink. Good luck w your book! Cool. You rock too. Your stunt made me crazy. Nice post as always. What a beautiful trip! Good on ya for overcoming your fears and getting out of your comfort zone. It almost felt as if I was there. I am glad that you felt the greatness of God’s creation in contemplating the 12,000-year-old glacier. The next trip they come to Cadiz in Spain. Now i want to go to Iceland! ..hate the cold n outdoorsy stuff but im all for stepping out of my comfort zone! Glad you enjoyed it. Did you see where Bobby Fischer stayed? “You’ll go numb and won’t feel it after that.” I am cracking up! At least you had a sense of humor about it! I too hate the cold and the wet, but it sounds like I may have to check Iceland out. What awesome memories! I’m glad you had a wonderful trip and thank you for the tips! Just added horseback riding on the Iceland coast to my bucket list! Gorgeous pictures and wonderful tips, thank you for sharing! I want to buy your book is it in stores? 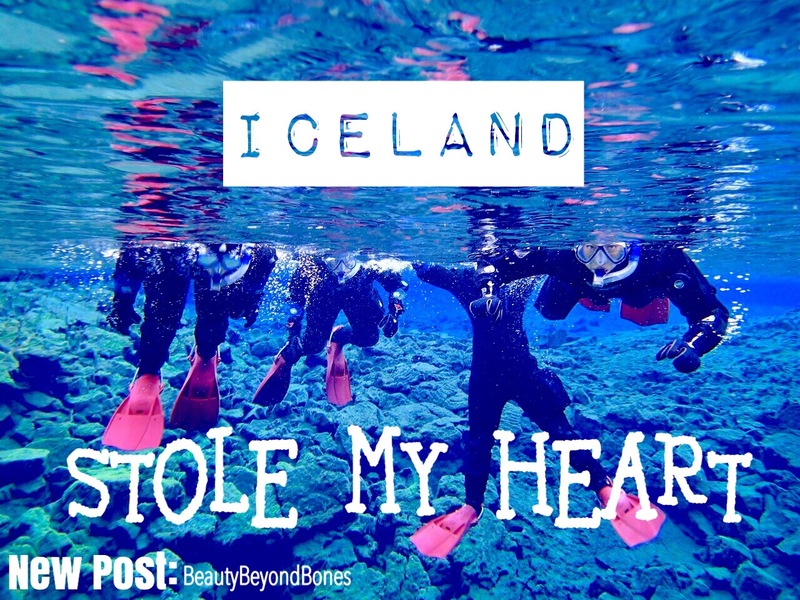 Your trip to Iceland has a lot of similarities to my trip to Atlanta! Lack of sleep and being outside my comfort zone not withstanding. And I don’t regret it one bit, though my body resents me greatly haha. I bought two books. My pastor friend wanted to check it out. There’s not much for modern or post modern women and our faith. I’ll probably see the books, next year. haha. Drysuits are nice for cold weather. I’m a little more ‘insulated’ so, they are more hot on me. Everytime I think of Snorkeling I remember this movie, Along Came Polly. Glad you had a chance to, shake it. Hehehe. I used to dive that area looking for leftover explosives. They paid us about 600 a month. I never saw much of the place. It looked neat from the boat. Caralyn, I am so so envious! Iceland has been on my bucket list to visit. Horseback riding on those Icelandic ponies would be my perfect day. As a rider, I know that you must have been sore after 3 1/2 hours! Thanks for the tips and and the pics. So jealous – now that makes me want to go!!!!! So glad you were able to experience all of Gods wonder in that trip! Wow when you think about it like that, it really makes you think twice!! Guess who hit the jackpot? Woo hoo….this guy – hellooo! #Bloom is in the house! My jaws just had a smile party and my heart is saying – “Now, that’s what talking about. You better open it up Ish. Read something.” Good job Caralyn. Praying for healing for your food allergies. Glad you had such a great experience Caralyn. Loved the pictures. Mad props to you for trying something out of your comfort zone. I need to take a page from this post and do the same in my life and add to my life experience. Thanks for sharing! Cold isn’t too bad but freezing is another. I hate humidity and being hot. Love the lakes, streams, rivers, but not a fan of the ocean. You are brave beyond words. Snorkeling, snorkeling, snorkeling, flying, flying, and going out of your comfort zone. I am very happy for you that you were able to do this. I love that!!! Need to find those types of Emojis. Sounds like an awesome trip! I’m proud of you for getting out of your comfort zone! I think I’ll put Iceland on my top ten! Looks like a great trip. I hope you have more adventures and share them. I love the outdoors and wish more people would get out and about. Thanks for sharing your tips. That trip is on my bucket list. It is a reminded of the wonderful places the Lord is preparing for Eternity. Love your exuberance and delight in a beautiful country which you maintained throughout adverse weather conditions. Thanks for posting. Did you miss the blue lagoon ? Yes , I agree on that and it’s really amazing experience . I like it . Have a good day . OH MY GOSH! i want to go horseback riding for 3.5 hours in ICELAND! glad you went on this adventure! it sounds amazing! Best vacation ever for my family. I was ready to buy a remote cabin and become a reclusive island poet. If Iceland is not on everyone’s bucket list, fix that… by putting it at the top!